The U.S. added 261,000 jobs in October, with many of the new positions replacing those lost due to Hurricanes Irma and Harvey. 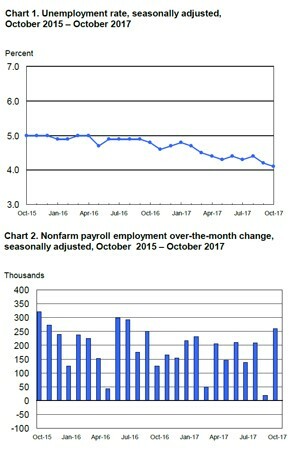 While Bloomberg economists estimated the country would gain 313,000 jobs last month, they anticipate that October’s numbers will mark a return to steady hiring increases over the next several months. The unemployment rate fell to 4.1 percent in October, from 4.2 percent in September. Meanwhile, the underemployment rate dropped to 7.9 percent, which is its lowest level since December 2006, Bloomberg noted. “There are obviously storm distortions in this report, but the decline in the unemployment rate reflects ongoing improvement in the labor market. November is going to clear a lot of this up,” said Michael Gapen, chief U.S. economist at Barclays Plc. Average hourly earnings for all employees on private nonfarm payrolls saw little change in October, declining by 1 cent to $26.53. The decrease follows a gain of 12 cents in September. Average hourly earnings have increased by 2.4 percent over the year. The most significant change in employment industry-wise was the 89,000 jobs gained back in food services and drinking places in October. These positions replace some of the 98,000 jobs in this sector shed in September, which were largely lost due to the hurricanes. Professional and business services gained 50,000 positions in October, while manufacturing added 24,000 jobs. Healthcare employment grew by 22,000, with ambulatory health care services responsible for 16,000 of the new positions. Industries that remained relatively unchanged over the month included construction, wholesale trade, retail trade, transportation and warehousing, information, financial activities and government. Bloomberg reported that as the U.S. seems to be nearing maximum employment, the Federal Reserve is likely to raise interest rates next month for the third time this year.